Inspired by a this comment by UnexplodedCow, I thought it might be fun to talk about words that many guitar players use incorrectly, whether they know it or not. UC's example: "Tremolo" when we mean "vibrato", when refering to a guitar's bridge. A vibrato is an oscillation in pitch, while tremolo is an oscillation in volume. So while effects pedal designers get this right, we get it wrong when talking about what this spring/bendy bridge does. They'll say "coil tap" when they mean "coil split". "Phase switch" vs "Polarity switch"
Re: What are some words guitar players get wrong? Calling the 13-pin synth interface jack a MIDI jack. I maintain that there's nothing wrong with calling it a phase switch. By reversing the polarity of one of the pickups we put their respective output waveforms out of phase with each other. The resulting thin nasal tone is caused by phase cancellation. I'm likely misunderstanding, because I've literally only ever STARTED reading anything about it in the last 2-3 weeks or so, and only briefly. I guess it matters just how out-of-phase a phase switch makes things, right? Something can be slightly out-of-phase, or it can be pushed to the point where it's opposite polarity, no? In my head, a polarity switch could be a type of phase switch, but a phase switch isn't necessarily a polarity switch unless the shift in phase is half the wavelength. Although now that i think about it, since it's just an "on/off" switch and not a potentiometer and not variable, the phase is probably just pushed all the way out to be a polarity reversal, huh? So in that case, where one would equal the other, I suppose they would be interchangeable, huh? The first time I ever heard the word "phase" as relating to the guitar was around 1972-73. My brother had just gotten a little flexi-disc out of a magazine and played it for me. It was Les Paul himself talking about the new Gibson Les Paul Recording guitar and the Triumph bass. At 2:25 he says, "How 'bout a funky gut-bucket sound? Flip to out-of-phase position and experience this!" Les knew what he was talkin' 'bout. But check out this vintage add for the Les Paul Recording! 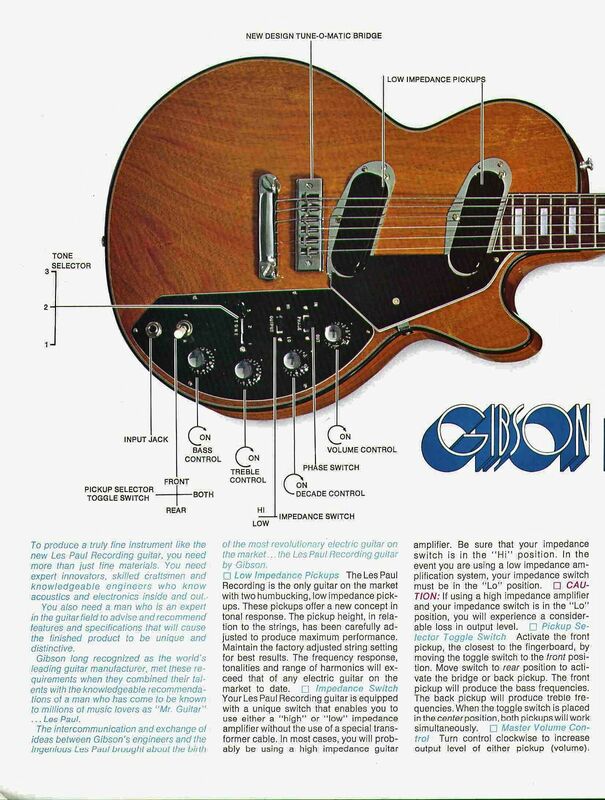 Gibson calls the output jack an input jack! A girlfriend of mine comPLETEly misunderstood the Decade Control pull pot. I'd pull it out and she would immediately blink out and reappear in a flapper dress and an It Girl haircut.. bizarre woman. That's pretty cool, Elfdude! I think it's hilarious that Gibson listed it as an input jack. Doctor Turn wrote: A girlfriend of mine comPLETEly misunderstood the Decade Control pull pot. I'd pull it out and she would immediately blink out and reappear in a flapper dress and an It Girl haircut.. bizarre woman. skully13a wrote: That's pretty cool, Elfdude! I think it's hilarious that Gibson listed it as an input jack. I've heard people try to explain, "Well it's taking in the plug from the cable, so it's in input". If that's their argument, then there are no* output jacks. Last edited by spudmunkey on Fri May 18, 2018 10:56 am, edited 1 time in total. That thinking leads me into a weird loop that makes my brain collapse into itself. If the hole a jack goes into is an input jack because the jack goes into it... then what is the cable? An output jack? And what about at the amp end? You've given me a funny new mental image for "sneeze guard". I've got one: using words like "less" and "more" when describing "tone". Not aspects of tone, but tone itself. "Losing tone", etc. While I agree that the use of the word tremolo to describe bridges with whammy bars probably originates with a misunderstanding of the terms (namely tremolo and vibrato), one could argue that this is one those cases where usage drives language. A wavering effect in a musical tone, typically produced by rapid reiteration of a note, or sometimes by rapid repeated variation in the pitch of a note or by sounding two notes of slightly different pitches to produce prominent overtones. a mechanism in an organ producing a tremolo. a lever on an electric guitar producing a tremolo. Additionally, I just can't bring myself to calling it a vibrato bridge. "Trem" just feels like the right term by now, despite it's dubious origins. Not that "vibrato bridge" is wrong, it is just limited. It's not like vibrato is the only thing you can do with it! On a keyboard, you can do the same types of fun things (flutters, dives, vibrato, bends) with the pitch bend wheel/stick, but you don't see it described as a "pitch bend bridge" on a guitar, though that term would more accurately describe what it does. Hey! I wrote something inspirational. There's a first time for everything. About "coil taps" vs "coil split." .......I'm not really sure if either could be considered correct, given how that operation happens. It might be better to call it "coil grounding," or simply "dual/single coil" switching. I'm thinking about it purely from the idea that the coil is typically grounded only, with no connection on its positive output (or it's shunted to ground, making it a grounded coil instead of floating). Of course, we have the "vibrato" channel on Fender amps. Thanks, Leo, for getting that backwards, and setting a trend of incorrect nomenclature that endures. One note about "phase" and "polarity." The supposed "out of phase" switching is not quite right, either. Let's take a look at how a Strat does it. That middle pickup is a reverse wind/reverse magnet polarity design. Thus, when it's in parallel with, say, a neck pickup, you have inverse phasing of the pickups (due to their wind, as well as inverse magnetic polarity), and it can act more like a humbucker (ever notice the hum can decrease in the 2 and 4 positions?). Electrically, it *is* a humbucker (in parallel, and not serial coils, unless some more switching is done). Now let's take that middle pickup and swap how it connects to the circuit. Suddenly it's in the same phase as the neck pickup, but with a reverse magnet polarity. In this configuration, you have phase cancellation due to mismatches in the pickup designs (middle pickups are typically a reverse wind/magnet polarity of a bridge pickup). In the end you get that weird, thin-sounding output, which is directly due to phase cancellation of a greater magnitude than what a humbucker does. In another, related thing, people will claim their pickups are something like "8 ohm," when trying to specify DC resistance. This is *very* incorrect. An 8 ohm pickup would do exactly nothing, unless it had a matching transformer to change the impedance "seen" by the amplifier circuit. The best example would be a Lace Alumitone (they read less than 1 ohm on the main coil, and the matching transformer does the rest). A typical pickup is measured in Kilo-ohms. Small detail, though it can mean huge things. If we want to get into some real hairy territory, we can talk about music, and how it's stated compared to the correct theory. Example: a song in the key of "E major." Technically, this would be E phrygian. It relates directly to the C scale (third, or phrygian, mode of). But it's easier to call it E minor since most guitarists don't phrygian care (OK, this was a long reach for a pun, but I tried). Oh, another one. "Bridge," when referring to the saddle(s), which are mounted in the bridge. This also relates to the integrated "bridge" that is an all-inclusive tailpiece/bridge/saddle design (like the FT6). I probably could write something about "F-holes," but I think that is self explanatory, and always worth a smile/chuckle/guffaw. Last edited by UnexplodedCow on Mon May 21, 2018 7:52 am, edited 1 time in total. ilyti wrote: While I agree that the use of the word tremolo to describe bridges with whammy bars probably originates with a misunderstanding of the terms (namely tremolo and vibrato), one could argue that this is one those cases where usage drives language. Great mention with the definition, and something I'd forgotten to consider (tremolo picking). I believe the organ's effect would be more a natural phase cancellation.